There’s nothing better than a bowl of perfect guacamole in my house. Well, except for a bowl of perfect, green guacamole. Once there’s a hint of brown (a result of the avocado oxidizing), my kids won’t touch the stuff anymore, even though it’s perfectly safe to eat. I don’t blame them…brown guacamole is just gross looking. I’ve always wanted to know how to keep guacamole green without covering it with plastic wrap after every dip. Check out my best tips of the guac trade, including how to keep guacamole green for the entire duration of a party. That’s right, there’s a way to keep your guacamole looking fresh and green all throughout the party, even if you make it in advance. The secret is in the avocado pit. This tip comes by way of a dear friend whose brother is a chef. 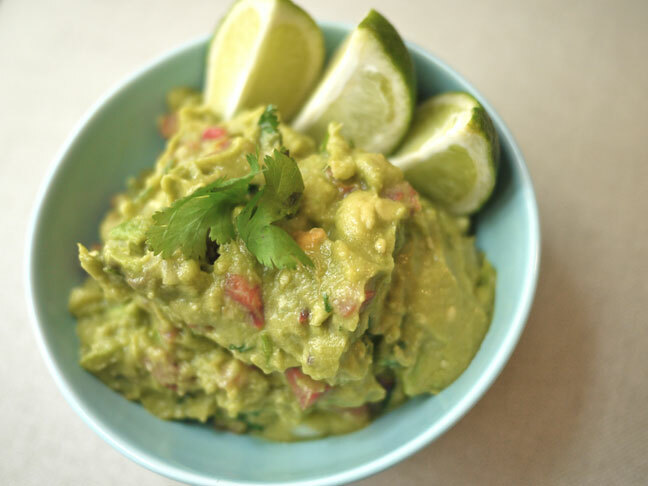 You simply bury the pit in your bowl of freshly made guacamole before putting it in the fridge or setting aside until the party, and it’ll look as good as the freshly made stuff when your guests arrive. You can even leave the pit in during the party for a rustic feel. This will keep guacamole green, and your guests will surely ask you what’s up with the pit in the guacamole. Then—bam!—you can drop your knowledge. It’s definitely a foodie party trick. Now, on to the guacamole itself. Giving an exact recipe feels wrong. I know I’ve said that before, but this time I’m serious. So serious that I’m not giving exact measurements. I command you to taste as you go. Use fresh, ripe avocados. Check for ripeness by gently pressing the avocado. If it’s hard, don’t bother. Even if you manage to mash it to the right consistency, it will not taste good. On the other hand, if the avocado is very dark green (almost brown) and has a lot of give when you press, it’s overripe. Not good either. Add red onion. If you ask me, red onion is the only option. Yellow, even a sweet variety, will be too sharp. Add tomato. But not too much. Make sure it’s ripe and please be sure to squeeze out the seeds. Otherwise, it will water down your guac. Add cilantro. Unless you’re one of those people who really can’t handle cilantro, this is a key ingredient. And I’m not suggesting a few pretty leaves. Grab a palm full and get busy! Don’t be afraid of adding jalapeno or Serrano peppers. I’m not suggesting that your guac has to be spicy. If you carefully de-seed and de-vein your peppers, the peppers will add a bright, almost herbaceous accent, not heat. If you also want heat (yes, please! ), leave the seeds and/or veins. Add lime juice and more lime juice. Lots of lime is the difference between good guacamole and great guacamole. Not to food-geek out, but the interplay between earthy avocado, grassy cilantro & jalapeno, and tart lime is what gives guac POW. Salt, salt, salt! Salt is the final and, in some ways, most important ingredient in guacamole. Taste as you go—nobody likes over salted food—but don’t be afraid. Salt is a flavor enhancer, and guacamole is all about big flavor. Mash the avocado, but keep it chunky. (Let’s be honest: super smooth avocado is weird.) Make it fun by bringing the kiddos into the kitchen. Have them use their hands to break up and mash the avocado. Other than the tomato—which should be diced into about ¼-inch pieces—everything should be minced. The chunks should be chunks of avocado, not raw onion, chili pepper, or cilantro leaves. And, I cannot stress enough, taste as you go. Guacamole isn’t an exact science. Everyone has a version, so why not make yours perfectly to your taste?